Gilles Peterson is a hero and a great tastemaker. When the opportunity to work with WorldWide FM presented itself, we didn’t have to think twice. V2 Update: We updated the apps. Now there’s Live and Collections. Collections is a sub set of the whole back catalogue, especially selected by the WWFM team. V1 Some time ago, we were approached by our friend Nalden. He nudged us to see if we were interested in working on Gilles’ new platform with him. Obviously, we said “let’s go!”. After a few calls with the team of WorldWide FM, we proposed to get them app-borne asap and agreed to work with them on other stuff and the extension of the app functions after the apps went live. Now, on the 23rd of March, the apps are live, and we look excitedly to the future. 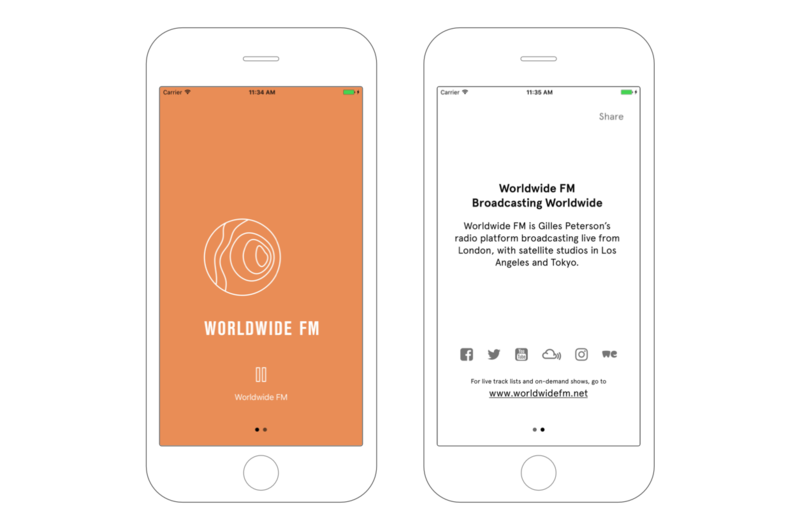 Although the most important part has already been solved: WorldWide FM now reaches mobile users worldwide with an app – easy mobile engagement they didn’t cater to before. For WWFM, we’re building out the full range of digital presence channels for an internet radio station. As of now, this station also has their own native Sonos app. Our relationship with Sonis/WWFM is booming – to be continued!